2.4 El Hijo de Black Shadow/Black Shadow Jr.
Born in Allende, Nuevo León, a town at 40 minutes from Monterrey. One of his earliest memories as child was that he used to watch wrestling shows on TV in a grocery store of his neighborhood each tuesday. He paid 20 cents to watch the shows and he dreamed to become a professinal wrestler. He used to watch Aníbal, El Marquez and Chucho Villa. One day his mother went to the store and took him away. He told her that we wanted to become a wrestler someday. 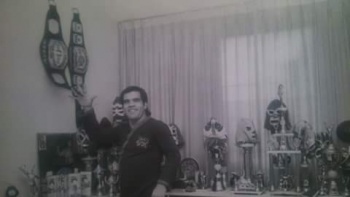 Although he was trained and advised by different professional wrestlers such as Manny Cabrera, Villano I, Villano II, El Vasco, Tonina Jackson, Califa, Rolando Vera, Ciclón Veloz and more he considers himself as a self-taught wrestler. He did not have a formal trainer he went to different gyms and trained with different wrestlers. Pedro Moguel was an olympic wrestler and he trained greco-roman wrestling with him for a couple of times. He was even rejected for his short height and weight but he insisted and kept training. He trained for three years before his debut. He had two jobs in Monterrey as office boy and paperboy. Gimnasio de Monterrey was at one block from his workplace. Once he finished as paperboy, he went to train to the gym. He was hardly admitted due to his very young age and size. Rejected from Gimnasio de Monterrey in several times, but he insisted again and again after resisting the beatings from Manny Cabrera and trainees. He attended the syndicate meetings preceeded by Tonina Jackson. At first he did not allow the boy, but he received the explanation of how hard he tried to be accepted in the gym. He was very young when he started his wrestling career at the age of 13. His first name was suggested by a fellow wrestler, El Lobo. That name was Pequeña Maravilla because of his age and physical complexion. He was invited to Villa de Guadalupe, Nuevo León. His first salary was $5 pesos. He did not have a license yet. In 1964 he was invited by the Lothario brothers to participate in a wrestling show in Terraza Altamira which used to be a movie theater as well. That arena was three blocks from his home and he accepted the invitation. His ringname for that match was El Niño Fidencio he did not cared about the name or the gimmick, all he wanted was to wrestle. He used a bouquet of flowers as part of the gimmick. His opponent was El Tigre who beat him and hit him with the bouquet. There is one anecdote about this wrestling experience. One of the neighbors told his mother that her son was a a wrestler. She refused to see her son in that brutal sport, so she went to the arena, she entered without a ticket, she went to the ring hit Florencio with a strap, El Tigre and even the referee. She took her son out of the ring and the crowd thought that everything was part of the spectacle and all were having fun of that scene. He received a punishment at home. After working at small arenas. In 1985 he went under a new ringname. That name was strongly based on the comic book character of Kaliman. There was a wrestler under the name of Kaliman and as his tag team partner he used the name of Pequeño Solin. He wrestled as Mr. Zet few times since a local luchador from Matamoros missed the date and he replaced him. During that time he assisted Rene Guajardo with the División del Norte. He was willing to venture to Mexico City, but Guajardo refused because of the size and weight of Solin. Even with Guajardo's disapproval he went to Mexico City seeking for opportunities. After some difficulties, he had the fortune to met with Villano III. He supported him in his venture and introduced the promoters Francisco Flores and Benjamin Mora. He was able to wrestle against heavyweights such as Canek. He succeded in his divison at LLI/UWA at featherweight and lightweight divisions. With twenty years of wrestling career he saw the new wave masked luchadores. He decided to mask under a new name. 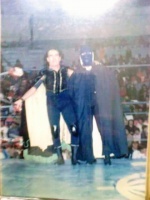 He met with Black Shadow and asked for his approval to be Black Shadow Jr. Alejandro Cruz agreed making everything formal. He was introduced by Alejandro Cruz himself in El Toreo and his presentations in Monterrey, Tijuana, Los Angeles and other important cities. He succeeded in winning championships and luchas de apuestas. After his mask loss against El Hijo del Santo, he used the gimmick of El Títere in LLI for a while. In independent events he presents masked as Black Shadow Jr. and he removes his mask at the end of the shows. Raúl Morales was a boxer and neighbor of Juan José Salazar and he never wrestled under that name. Raúl Olivares was the owner of the Gym where he trained but not his trainer. 90/07/29 mask (1) Black Shadow Jr. Huracán Jr. Plaza de Toros Monumental - Monterrey, N.L. 91/12/15 mask (2) El Hijo del Santo Black Shadow Jr. Plaza de Toros Monumental - Monterrey, N.L.